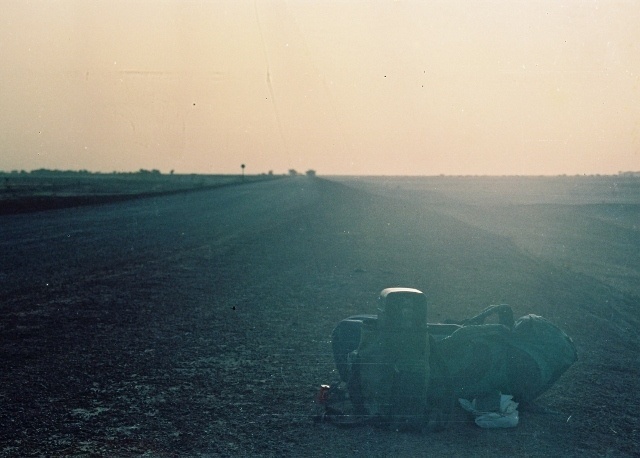 by Andy Higgs in Africa, Algeria, Places, Retro Travel Photo. In this new occasional section we share some of the travel photos from our archives – when we paid our dues but rarely our way. Times were tough, hitch-hiking was a favoured mode of transport (yes, even through the Sahara, as shown here) and luxury hotels were places we tried to sneak into to have a swim. Way back in the golden days of 1992 all I needed was my rucksack and my ghetto-blaster. This picture was taken just outside the beautiful town of Ghardaïa, Algeria, where the road south to Niger is still tarmac. I got a lift to the city limits from the owner of the hostel I stayed at and settled down to wait for my first lift. I think this was taken about 8 a.m. and it was just starting to really heat up, but I only stood there fifteen minutes before a 2CV stopped and its five local occupants squeezed up to fit me in. Top of the list of countries I want to return to, Algeria is an amazing combination of stunning landscapes, incredibly hospitality and adventurous travel. The brutal civil war had just kicked off when I was there but I only experienced friendliness and charm. Again, this pictures was taken on my first (non-digital, obviously) SLR and the quality is not great, but so it goes. A bloke in SW Ireland picked us up mid-afternoon and dropped us at a busy intersection saying ‘if you’re still here in 3 hours when I’ll be on my way to the pub, I’ll pick you up and you can join me for a pint.’ Low and behold 3 hours later we were still there – despite my mate Pierre lying in the middle of the road at one point! He took as to his local, which was a small pub in the middle of nowhere. The drinks started flowing and we were made to feel very welcome. At around 10pm one guy pulled a tin whistle out of his coat pocket, another suddenly plucked a violin out of nowhere, another a small drum and the singing started. We had a cracking night, at the end of which we slept in the field opposite the pub, although we didn’t quite have the stamina to pitch the tent! The next morning we got a lift in a brand new Mercedes within 5 minutes of waiting. In Ghana I was walking to the bus stop without even sticking my thumb out when I got a three-hour lift from Kpando to Accra from a very friendly local. I got picked up by a fierce-looking Maori, his face covered in tattoos, in an old Cadillac in South Island, New Zealand. I was slightly wary, having recently watched the extremely violent ‘Once Were Warriors’, but he turned out to be a thoroughly nice guy and went miles out of his way to get me to where I wanted to go. Also in New Zealand a young couple picked me up, and the wife, who was very chatty, invited me to join them at the beach. Fortunately, I caught the husband’s expression in the rear view mirror and realised he was less than keen on the idea, so I declined the invitation! In Zimbabwe I rather foolishly picked up a local guy who seemed intent on stealing my pickup until I pointed out that it belonged to the government and mentioned I was a close personal friend of the Minster (the former was true but not the latter!). In Scotland my car broke down and a couple picked us up and towed my car to their house in Stranraer where they gave us dinner and insisted we stay the night. The next day we took the ferry to Belfast and when we came back a week later the husband had repaired my car free-of charge! There were several other lifts involving indoor air pollution of a particularly uplifting kind but perhaps this is not the place to share them!